This is a fragment from Old City Hall of Bratislava. How did the fire salamander get into architecture? Well, Central-European forests, covered with dry leaves, are the home for this creature. Aswell as the entire Europe to the south or west from the Carpathians. 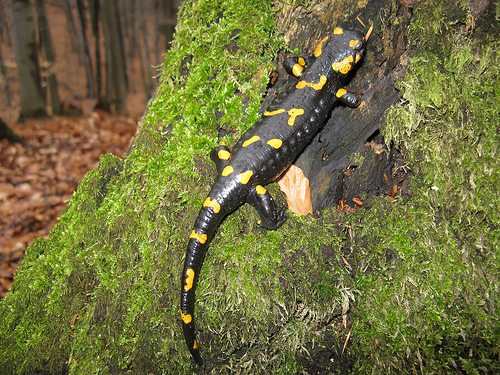 Fire salamander is the natural source for mythological creatures, symbolics, ideologies, etc. The animal itself (salamandra salamandra) is a black lizard with yellow spots, which in the head area are poisonous. It burns, when you touch. Because this lizard has seen the fire. In mythology, salamander is the one, who is guarding deep caves with gold and silver melting together in the deep of earth. Therefore, basilisk is coming as the owner of the worst poison, which has also power to return life when it has passed in special cases, and which is associated with philosophers stone. Basilisk - the king of snakes, or the dragon. Together with salamander, they handled the treasures, as salamander could stand the powerful fire of basilisk, the fire, that could turn anything to gold (reference to Nina T). Who was the owner of those underworld treasures? Of course, all such treasures belong to dwarfs. The germanic dwarfs! It is an historical interpretation and a symbolic legitimation act that the colors of Habsburg flag correspond to the colors of Holy Roman Empire`s coat of arms. In this case there is also another layer of reality. The Habsburg empire can be compared with fire salamander, a site specific creature, that`s mythology reflects the Habsburg identity quite well. Basilisk is universal symbol of The Other, mainly a hostile force or an enemy. Killing a basilisk is a common symbolic act of taking power, creating a kingdom, spreading an empire. Its represented in symbolics of many countries. Not in Habsburg Empire, which was an extremely diverse and multicultural area. In this empire basilisk and fire salamander live together, basilisk creates wealth and salamander protects it. Everything is owned by a dwarf. Or not. That is still a question, whether Austrian identity can be linked with dwarfs. Lets call it a silent presence of a dwarf. Probably the empire is most comparable with the basilisk itself, a german dwarf, who has gone too far to the east and is protecting himself with fire salamander, the site specific content, a lot of nations, who he uses and exploits as a shield against Russian and Ottoman empires. Here is a legend from Vienna about basilisk as mythological creature living in a well. The basilisk is killed with a mirror. This story probably refers to real estate issues.